After the worldwide success of Tommy, Pete Townshend decided to take a second stab at "rock opera" and 1973's Quadrophenia was the result. Its premise is rooted in a teenage perspective in 1964-'65, and the friction between "mods and rockers" in the London and Brighton regions of the UK. 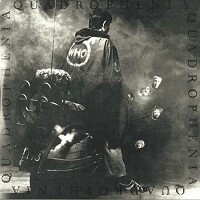 The four-way split personality of the central figure "Jimmy" has been admitted by Townshend as also being based on the distinct personalities of the four band members. The legendary Glyn Johns' production is both powerful and stunning with the writing and arrangements, featuring maybe the most tasteful use of both sound effects and synthesizers in rock recording, brilliant. This LP was mastered and cut from the original ¼" analog master tapes by Chris Bellman at Bernie Grundman Mastering using Classic's all-tube analog cutting system. Gatefold artwork including tipped-in 44-page booklet are given the usual Classic authenticity treatment down to the paper stock being original. Customer Reviews (3.83 Stars) 6 person(s) rated this product. This album sounds great. It is the pressing that is so poor. One album has a very bad warp, the other has all sorts of scuff marks. I would return but have found that neither the warp nor marks are audible. I will think twice before buying from this label again. Surprisingly, Acoustic Sounds owns the Classic Record label. Excellent sounds. Pressing quality an issue. This album sounds amazing. It was mastered very well in my opinion and is worth purchasing if you can't seem to hunt down an original copy of it. That being said, I highly recommend trying to track down an original copy of this album before resorting to spend 50 dollars on a "new" pressing. The reason I say this is because of quality issues. I know it's not Acoustic Sounds' fault. They helped me quite a bit when I was having issues with the vinyl. But, this 140gram reissue; while the lesser of two evils between the 200gram as far as pressing quality, still had some irritating problems. What I received were two records that were warped and had marks on them. Although none of it was audible, so in the end I decided to keep it. Plus the mastering was, as I mentioned, very well done. Just as the title suggests: great mastering, bad quality control from Classic Records. Ive bought a few of classics 200 mg. pressings and the sound has always been good but the quality of vinyl has always been horrible, too many clicks and pops. I opted to try this 140 weight version of this album and I'm so glad I did. The Re-mastering is amazing and the vinyl was absolutely flawless. I cant find a click in it. I never thought I would like this album but every song is great, and this is a true demo disc. Finally something from Classic that has impressed me.